Prince George's Whitney Warren, one of only two players to have appeared in every National Championship, will this year skip the defending national champions on home ice. His team of Frank LaBounty (3rd), Gerry Austgarden and rookie lead Allison Duddy beat Gary Cormack 7-1 in the final of the three team championship. Cormack, with Rich Green, Vince Miele and Corrine Jensen blanked the first three ends before taking their single point at the half-time break. Warren scored two in the fifth, stole one in the sixth and made it handshake time with a steal of four in the seventh. Both teams will compete in Kelowna at the Nationals, March 15-21, with Cormack's team playing as BC Hosts to round out a ten team field. It is worth noting that both Warren and LaBounty are quads who use power chairs. They have also won gold at the previous three national championships, twice with Jim Armstrong at skip and in 2007 with Darryl Neighbour skipping. Norway finished the final pre-Paralympic tournament with a six game sweep against major opposition in Perth, Scotland. The beat Great Britain, Sweden, Germany and Switzerland and two Scots development teams. The final table is HERE. 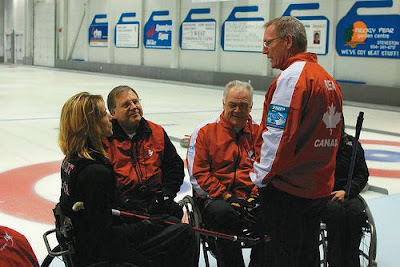 Though Norway's new coach Per Christensen has not officially announced his Paralympic team, it appears from Bob Cowan's photos of the event that the team may be the one that competed at the 2009 Worlds. 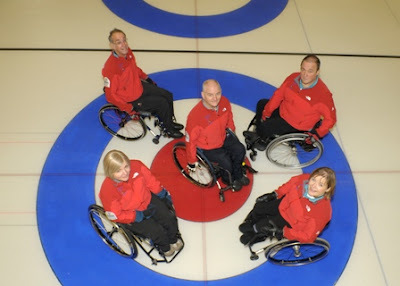 Paralympian gold medalist Gary Cormack's CVCG Avengers, with Rich Green (3rd) Vince Miele and Corrine Jensen advance to the final of the BC Provincials after beating Whitney Warren and Cyril Kinatkin in the three game round robin. Whitney, with fellow multiple National Champion teammate Frank LaBounty (3rd), Torino gold medalist Gerry Austgarden and rookie Allison Duddy will face Cyril Kinatkin in a semi-final. The semi-final is at 10am and the final at 2pm Sunday January 31. The losing finalist will become the BC Host Team. Team Canada coach Joe Rea tells Jason Peters of the Prince George Citizen that coaching the national team has fulfilled the dream of wearing a Team Canada jacket that eluded him as a player. "To have this opportunity to go to a Paralympics in your own country and represent your country is the biggest honour I'll ever have," he said. Norway posted two more wins against Paralympic contenders on the second day of competition at Perth, Scotland. The defeated Sweden 6-4 and Gemany 7-6. They also beat Scotland I 6-4 to end the day 5-0, two games ahead of Great Britain (3-0). Five national teams and a couple of Scottish development squads are competing at the Dewar's Centre in Perth, playing alongside teams competing for the Scottish Ladies' Championship. Norway started well, beating Scotland II 9-7 and then Great Britain 6-4. Their coach, Per Christenson, who has yet to officially announce his Paralympic side, had said he didn't want his team to peak too early and Norways performances too date have been patchy. But they have been the side that Canada has found difficult to beat when it mattered. Great Britain straddled their loss with comfortable wins over Scotland I and Scotland II, with Aileen Neilson reportedly throwing fourth stones. In other matches, Sweden beat Switzerland 6-3 while Scotland I overcame Scotland II 6-4. Results can be found HERE. Team GB third Aileen Neilson gave an extended interview to Paul Thomson of the East Kilbride News. She talks about her life before her disability, how she came into wheelchair curling, how she has prepared for Vancouver and her hopes for success. Scots curlers, who make up the Great Britain team, are generously financed by the government and appear to see publicity as part of their responsibility to the sport. I have recently linked to articles mentioning every member of their team. Team USA also feature regularly in the press and media, as the USA curling authorities understand that the national team is their best advertisement for increasing participation. Again I have linked to articles on all the team. Canada has instituted a pre-Paralympics media protocol explicitly discouraging informal press (including me) contact with team members, and insisting that all requests for interviews be cleared with a "media liason officer." Standard procedure. apparently, but just one reason why you'll find so little information about the team on this blog, or read mainstream media stories covering anything other than Jim Armstrong's phoenix-like rise from the ashes of a ruined able-bodied curling career. Team Canada, also funded by public money, should be doing everything in their power to court publicity, realising that often means not only going out of their way to contact media with stories, but supplying journalists, notoriously lazy, with material. Instead they issue no press releases, or invitations to watch the team prepare. They don't train in different locales while inviting local curlers to interact with the team, which would attract local TV. You can call it necessary focus, and claim that gold in Vancouver wipes away all objections, but making a two year campaign solely about winning a gold medal puts everything in just one basket, and we can only hope it's a sturdy one. To be successful a sport has to make its audience care about the participants. If all Canadians are asked to care about is a gold medal, then it's a disaster getting anything less. But more, once the competition is over, people will stop caring, and that's no way to nuture a sport and provide for the future. Team USA skip Augusto Perez, and his photogenic family, are part of the US Anti-Doping Agency's latest media campaign. Curling Québec est fier d’annoncer la tenue de son premier championnat provincial de curling en fauteuil roulant qui sera présenté les 20 et 21 février prochain sur les glaces du club de curling Lennoxville, dans la région de l’Estrie. Le directeur général de Curling Québec ne cache pas son enthousiasme face à cette annonce : « Nous sommes particulièrement excités d’assister à ce moment historique du curling au Québec. La plupart de nos championnats provinciaux existent depuis plusieurs années, certains datent du début du siècle dernier. Par contre, de vivre la première édition d’un événement qui perdurera dans le temps demeure quelque chose de spécial ». 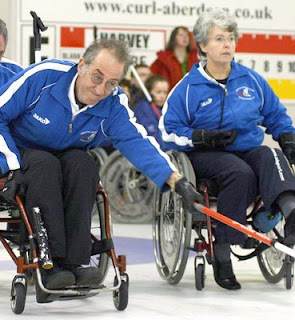 « L’an dernier, nous avons identifié et envoyé pour la première fois une équipe du Québec au Championnat canadien de curling en fauteuil roulant. Cette année, cette équipe devra remporter le titre québécois pour mériter ce privilège » mentionne M. Berthelot. Précisons que l’équipe championne représentera le Québec au Championnat canadien de curling en fauteuil roulant qui sera présenté du 16 au 21 mars à Kelowna en C.-B. La directrice générale de l’Association québécoise de sports en fauteuil roulant (AQSFR), Mme José Malo, applaudit cette initiative : « Le curling est un sport inscrit au Jeux Paralympique d’hiver et gagne a être connu puisqu’il peut être pratiqué par la majorité des personnes en fauteuil roulant. Il a été important pour nous de supporter les clubs qui ont initié cette pratique au Québec. Je tiens aussi à souligner le dynamisme et la grande réceptivité de Curling Québec dans ce mouvement. Grâce à ce travail d’équipe cet événement deviendra une tradition québécoise ». Pour la première édition, deux équipes s’affronteront dans une série 3 de 5. L’équipe qui a représenté le Québec l’année dernière au championnat canadien et aussi représentante du Club de curling Lennoxville est composée du capitaine Benoit Lessard, Carl Marquis (3e), Denis Grenier (2e), Johanne Daly (1ère) et Nicole Huberdeau (5e). Cette équipe est entraînée par le duo formé d’Alfred Whittier et Dan Janidlo. Ils seront opposés à l’équipe représentante du Club de curling Victoria (Québec), formée de Jean-François Sylvestre (capitaine), Michel Verreault (3e), Allan Burridge (2e), France Sévigny (1ère) et Maxime Aubé (5e). Leurs entraîneurs sont Jacques Palasse, Pierre Morneau et Jacques Deschênes. Les parties débuteront le samedi 20 février à 13h. La cérémonie d’ouverture sera présentée à 11h et pour l’occasion, nous procéderons au dévoilement du trophée qui sera présenté à l’équipe championne à la fin de cette compétition. Canadian comedian Rick Mercer filmed a segment on wheelchair curling shown on Canadian TV last year. For those who missed it, here it is. To see how closely and emotionally involved she is, you have only to read the Autumn 2009 issue of Paralympian Magazine (pdf). Without her, not only would wheelchair curling not be standing on a world stage; it is doubtful that Canadian wheelchair users would be playing at all. The CCA created a team so that Canada would be represented at the World Championships. 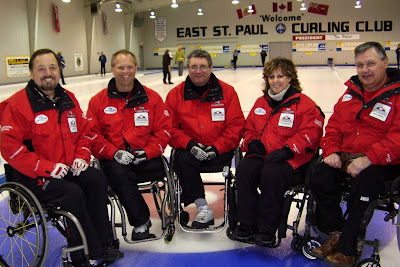 Then BC, under Linda Moore, were determined that Ontario wheelchair curlers, who made up the original team, would not go unchallenged so CurlBC spent money to create a team. Eight years later we have eight provinces and nine provincial teams, represented at our own national championships. 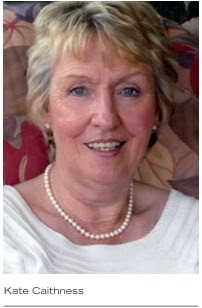 So we owe Kate Caithness a debt of gratitude for pushing the sport into existence. Her latest project has been to re-examine eligibility and assessment procedures that may bring even more participation. Which makes it all the more puzzling why the WCF stands by its recommendation that powered wheelchairs be banned from WCF sponsored competition, including World Championships and the Paralympics. Below is an extract from my January Wheelchair Watch (Issue 4) column which outlines the issues as I see them. Though wheelchair curling claims only a small part of the attention of the delegates to the semi-annual World Curling Federation meetings, big issues were at stake at Aberdeen last December. WCF vice-President Kate Caithness presented a paper proposing eligibility changes. She also addressed the present absence of an appeal procedure of an assessor's determination of player eligibility, either for or against. But the meeting failed to lift the legally dubious ban on power wheelchairs in WCF competition. If evidence existed that power chairs afforded a competitive advantage, or damaged the ice surface, the WCF should (and would) have offered it. 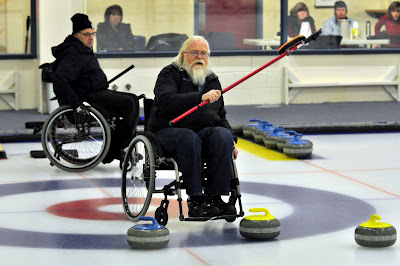 Without it the ban appears unwarranted discrimination towards a whole class of otherwise eligible disabled curlers. Those familiar with issues of discrimination know that one should never underestimate the prevalence of blind prejudice. A senior WCF official that I spoke to directly (not Caithness) suggested that power wheelchair users should just use manual chairs instead - presumably while eating cake. WCF officials have declined to respond to requests for the rationale behind their support for the ban, beyond saying that a decision will be made at the meeting next April in Cortina. It may be an uphill battle to persuade delegates to that meeting to go against the recommendation of the WCF executive. Most will be unfamiliar with wheelchair curling and probably will not have given much thought to the notion that people with disabilities so significant they require use of powered wheelchairs, also deserve an opportunity to compete. But it is an effort very much worth making, and I urge you to seek out and lobby your delegates, and raise the issue with your member associations. This ban can and should be lifted. January edition of Wheelchair Watch is available in SWEEP d-Mag. Team Great Britain's Jim Sellar, the likely fifth in Vancouver, told the Bellshill Speaker that he will retire from competitive sports if successful in Vancouver. Sellar (53), who is also a champion bowler, has curled for nine years and has represented Scotland at five World Championships, winning gold in 2004. Ken Gregory's Bradford rink rebounded from a morning final round robin draw defeat by beating Thunder Bay's Carl Levesque in an extra end of the gold medal tie-break game at the Ontario Parasport Winter Games at the Kingston CC. Gregory went out to an early 5-0 lead with a steal of 4 in the second, but gave back a steal of 3 in the fourth. Levesque took 2 in the eighth to force the extra, but conceded a single to lose 8-7 to the far more experienced Bradford team. Team Gregory will now be favourites to repeat as Ontario Champions at the Provincials February 17-20 at the Collingwood CC. Unfazed by Bradford's Ken Gregory's unbeaten record at the Ontario Parasport Winter Games, and by finding his team down 4-0 after 3 ends, Kenora's Wayne Ficek brought his team back with a 3 in seven and a steal in 8 to win 7-5. With Thunder Bay's Carl Levsque beating Ottawa's Bruce Cameron 7-4, the stage was set for a gold medal tie break between Levesque and Gregory this afternoon. Nine provinces have agreed to send teams to the Canadian Nationals taking place in Kelowna, BC from March 15-21, the same dates as the Paralympics. It had been hoped to have 10 provincial teams, but PEI made a late decision to wait another year before competing. BC will supply an additional "host" team to make up the numbers as happened last year in Nova Scotia. In a very positive sign of the maturing of the competitive side of the sport, seven of the nine have held or will be holding playdowns to choose their representatives. Team Saskatchewan were chosen last December, but Team Sobkowicz in Manitoba and Team Fitzgerald in Nova Scotia have already won their berths. Team formation in BC has been limited by the three females remaining after Sonja Gaudet and Ina Forrest made Team Canada and three-time gold medalist Jackie Roy, who trained with the national team, chose to stay in Vancouver to support them. Three teams compete for the two slots at the Juan de Fuca Centre, January 29 - 31. Ex-Canada teammates Gary Cormack and Gerry Austgarden will be opponents, though neither will skip. Teams are HERE and draw details HERE. Alberta are holding a four team round robin with playoffs February 5-7 in Edmonton at the Jasper Curling Club. Two teams will be from Calgary and two from Edmonton. Calgary's Jack Smart came within an inch of taking the title from BC at the 2009 Championship, but this year will be without Bruno Yizek who'll most likely be bench warming in Vancouver. Anne Hibberd, who was unable to play last year, steps in at 3rd while Martin Purvis continues at 2nd. Curling in Quebec has been centred on the Lennoxville CC, but they received a late provincial challenge from the Victoria CC in Quebec City. Lennoxville will host a playdown February 20-21. They will hope to have their skip, Ben Lessard back from the serious injuries he sustained in a water-skiing accident last summer. He'll play with Denis Grenier and Carl Marquis. Competition for the two female slots will be decided at a try-out session between Johanne Daly, Johanne Poulin and Nicole Huberdeau. Kenora hosts Northern Ontario's three team playdown February 5-7, with local Provincial Champion Wayne Ficek hoping to again upset the Fort William CC's Team Levesque and Team Dawid from Thunder Bay. Ontario have avoided the angst of last year by agreeing not to penalise areas supporting more than one team.This year the OCA agreed to allow participation up to the total team limit allowed regular curlers; so five teams will compete at the Collingwood CC from February 17-20. 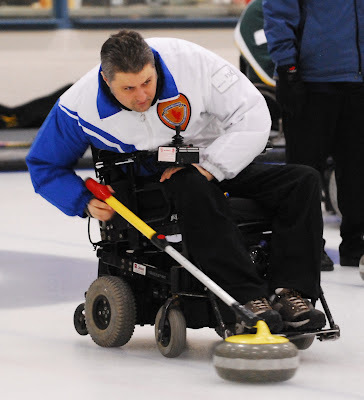 Bradford's 2009 Provincial Champion Ken Gregory will face Toronto's Chris Rees, Ottawa's Bruce Cameron and Richard Fraser, and Ilderton's Lance Claus, skipping a rookie squad coached by Ernie Comerford, who jump-started wheelchair curling in Alberta. The Vancouver Sun's Lyndon Little, in an interview posted on Kelowna.com, talks to ex-Team Canada skip Chris Daw about his new life as manager of the Vancouver CC and his thoughts on Canada's Paralympics prospects. Little writes that Daw insists the last thing he wants to do is to put any undue pressure on the team wearing the Maple Leaf. "All I'm saying is that I feel this team has every opportunity to hit the podium," assesses Daw. "Having been there before, my advice is they can do it as long as they keep their energy levels up and that their focus on the process remains level. They can't afford to look at the prize before they have it." The PEI Curling Association is sponsoring a free demonstration and workshop at the Crapaud Community Curling Club on Sunday January 31. A similar event was held in December, but the inclement weather kept many people from attending. It is hoped that representatives from all PEI curling clubs can attend these sessions. 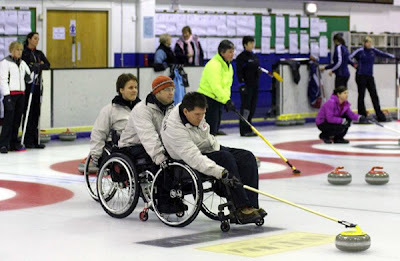 The wheelchair curling demonstration will be held from 10.00am-1.00pm. Those interested in participating should contact Gayle Johnston at 902-368-1071. PEI had hoped to field a provincial team at this year's Nationals, but have decided till 2011. 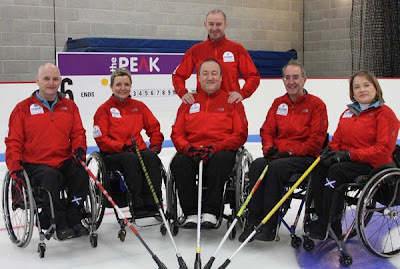 Bob Cowan reminds me that Great Britain will host the final international spiel before the Paralympics when they share the ice with the Scottish Men's Championships at the Dewar's Centre in Aberdeen. Germany, Sweden, Switzerland and Norway will compete in the seven team field that includes two teams from the Scottish Wheelchair Curling Association's performance pool. The wheelchair event begins January 29th and you can find the draw HERE. GB 3rd Aileen Neilson is interviewed in the East Kilbride News HERE. Ken Gregory's Bradford rink is leading the six team field at the Ontario Winter Games. With one draw to play they have a 4-0 record, and having already beaten Carl Levesque's 3-1 Thunder Bay squad, look set to take home gold regardless of the outcome of tomorrow's draw. They play Kenora's Wayne Ficek, and may be looking for some revenge after the 13-0 drubbing the were handed in a tie-break at he 2009 Nationals. The Royal Kingston CC is hosting the curling component of the 5 sport 2010 Ontario Paasport Games from January 22-24. Six teams wil be competing: Ficek (Kenora), Levseque and Dawid (Thunder Bay), Rees (Toronto), Gregory (Bradford) and Cameron (Ottawa). The first draw of the round robin event is 10am Friday Jan. 22 with the final scheduled for 2.30pm Sunday Jan. 24. Tie-breaks will only be held in the event of a tie for gold. The complete Games schedule can be found HERE. Results wll be posted on the Ontario Curling Association's website. 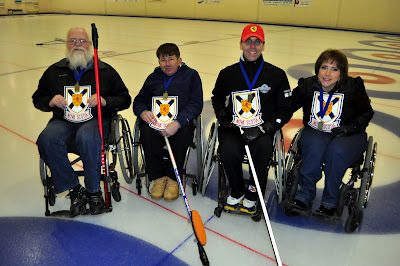 Team Fitzgerald beat Team Brown 3-1 in a best of 5 series at the Lakeshore CC today to become Team Nova Scotia. The series was tied at one overnight, but Fitzgerald stole one for a 5-4 win in an extra end in Draw 3 and, up one without the hammer in the 6th and final end of Draw 4, stole 2 to win 7-4. Mike Fitzgerald, Laughie Rutt and Trendall Hubley-Bolivar, who all played in the 2009 Nationals, will be joined by rookie Debbie Earle at the Nationals in Kelowna March 15-21. 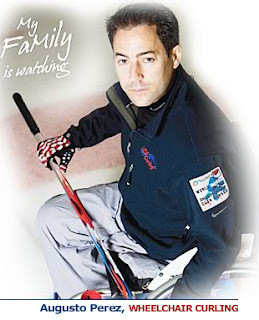 Tom Killin, expected to play second on Team Great Britain in Vancouver, began his Paralympic career at Arnhem in 1980. Now 59, he has competed in four Olympic sports at the games over a 30-year period, including basketball, fencing and table tennis. "It takes you right round the world, you see some amazing places" Tom told Adam Morris. "I'm away somewhere every month, it's a full-time job now." Read the complete profile HERE. The Royal Caledonian CC, the governing body of British curling, announced a familiar five names as the official Team Great Britain. Michael McCreadie will skip an all Scot squad that includes two other members of the team that suffered the heartbreak loss to Canada in Turin., Angie Malone and Tom Killin. They are joined by Aileen Neilson who took a leave of absence from her teaching job to train ful-time, and Jim Sellar who has attended four World Championships. Said Michael McCreadie: "It is an honour for me to Skip the British team at the Paralympics in Vancouver. I make up 20% of the playing Team and there are four others who are truly world class performers. We have worked extremely hard to get back into winning ways, with the results from this year's tour clearly indicating we are on the right track. Preparations have gone really well and we plan in the next nine weeks to hone ourselves into a formidable adversary ready to take on the rest of the world." 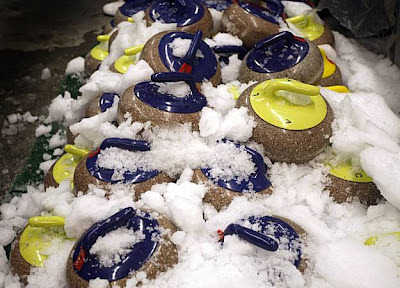 The San Francisco Chronicle reports that curling is coming to downtown Oakland. The San Francisco Bay Area Curling Club is expanding beyond San Jose and Fremont, with a curling Open House at the Oakland Ice Centre on January 30th. It being California, the rocks are cooled before use.And with one of the largest populations of young and active physically disabled people living in neighbouring Berkeley, there's lots of candidates for wheelchair curling. Curling began with mostly Canadians, but now it's mostly locals with plans to get local High Schools involved. Read the whole article HERE. Action Online, the magazine of the United Spinal, includes Team USA's Augusto Perez in a group of athletes asked to talk about their outlook on life. As befitting his style of play on the ice, Goose is forthright and positive. “The first thing is to get over the idea that people look at you because of the chair or any other device. People got better things to do than to worry about how we look, and if they do it is their problem not yours,” Perez says. Read the rest of his refreshing outlook on life HERE. Two three man teams are playing a best of five series to decide who claims Debbie Earle and represents Nova Scotia at the Nationals in Kelowna. [see 1/7/2010 post below]. In draw 1 it was Fitzgerald 8-2, with reuslts reversed in the evening as Brown won 7-3. There will be two draws Sunday (17th) and a decider Friday January 22 if necessary. CLICK HERE for Ian Readey's photos of the day's play. Chris Sobkowicz will represent Manitoba for the fifth time at the Canadian Nationals in Kelowna, March 15-21,after defeating Richard Dudek in a best of three playdown at the East St. Paul Curling Club. He made one change from the 2009 team, George Horning replacing Michael Alberg. Alberg played for the challengers, with Don Kalinsky and Effie Loubardias. Manitoba are an experienced side and will be favoured to improve on the bronze medals they won at the previous two Nationals; especially with with BC losing JIm Armstrong and Alberta losing Brno Yizek to the Paralympics. Andrea Tabanelli skipped Team Italy to a 6-0 record to win Germany's 2010 Identa Cup. Italy was one of two Paralympic teams in the seven team field. Jens Jager's Germany finished 4th with a 3-2-1 record. At the 2009 Worlds Italy lost their opening draw to Germany, but then won four consecutive matches, including a 9-5 defeat of Canada, before fading to a 4-5 record overall. Click HERE for full line scores and the final table. 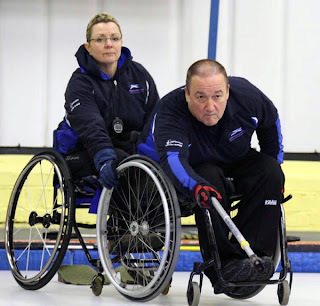 Making wheelchair curling a mixed gender sport was, according to WCF VP Kate Caithness, a key selling point in the campaign to join Paralympic Games. 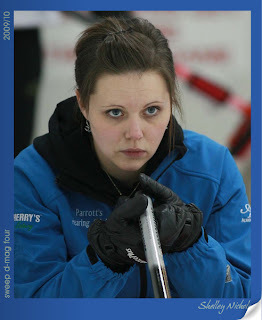 Recruiting female curlers, however, has been a struggle in Canada. Nova Scotia came up with a creative solution by having a two team 3 on 3 playdown with the winner claiming Debbie Earle, the lone female, as their fourth member. The playdown will be best of five games played January 16 and 17, and 22 if necessary at the Lakeshore CC in Lower Sackville, site of the 2009 Nationals. Team (Richard) Brown has Terry Cousineuau and Keith Williams and Team (Michael) Fitzgerald has Laughie Rutt and Trendal Hubley-Bolivar. The Lakeshore CC program has been going a few years now and has an active core of players who participate in regular league play and also the stick curling league. A new group is getting started at the Halifax CC, meeting on Sunday afternoons at 3.30 and supported by the  Canadian Paraplegic Association. For more information contact Darrell Robar. The five person team that will represent Sakatchewan at the 2010 National Championship in Kelowna next March has been selected. There is one change from the 2009 team, with Terry Hart (not shown) replacing Calvin Bird. The team: Del Huber (Regina) Gil Dash (Wolseley) Marie Wright (Moose Jaw) Darwin Bender (Regina) and Terry Hart. The team will again be coached by Lorraine Arguin (Moose Jaw) who will be assisted by Bob Capp (Regina). Did you know that Darryl Neighbour has 13 siblings? Find out more about the Team Canada members on the Canadian Paralympic Comittee's website. I'd post the photos, but they don't actually look that squished in real life. Team Canada skip Jim Armstrong gave an interview to an old friend, Fanny Kiefer of Vancouver's Studio 4 Shaw Cable broadcast. 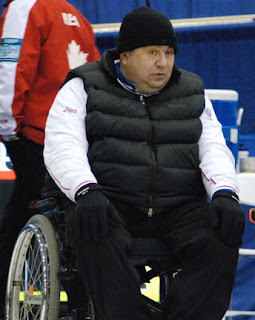 Sitting in a regular studio chair, he talked about his transition to wheelchair curling, how strategy in the wheelchair game is different from regular curling, and stumbled into describing eligibility for wheelchair curling in terms of rules that may come into effect next April. 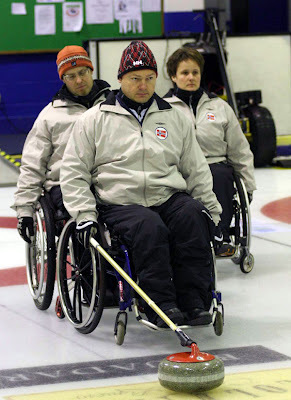 Jens Jäger's Team Hunters, who will represent Germany at the Vancouver Paralympics, are hosting the 2010 Identa Cup in Schwenningen, January 8-10. Seven teams will compete, including squads from Switzerland, Italy and the Czech Republic. The draw is HERE. Things may be looking up for wheelchair users in Saskatchewan as I have been contacted twice since Christmas by people involved in promoting the sport. At the moment activity is centred on the Callie CC in Regina and wheelchair users have ice time on Monday afternoons. 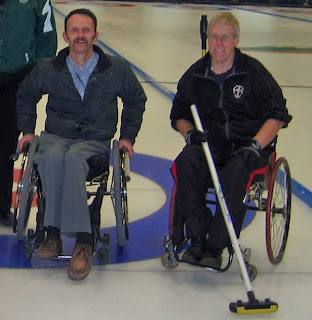 Darwin Bender and Del Huber of 2009 Team Saskatchewan, who finished a very creditable 4-5 in their first appearance at the Canadian Nationals in 2009, are part of a wheelchair team that plays in an Open League Wednesday evenings.